P’fish’ers, we are beyond thrilled to give you this fin-tastic news from San Diego: Our very own Andrew Ryland Spurgin has been honored with the Dr. Roger Revelle Award. Please see the news release below and join us in San Diego April 26, 2012, for the San Diego Oceans Foundation Gala. The event is nearly sold out so act fast! The San Diego Oceans Foundation has selected Andrew Spurgin as this year’s recipient for his dedication of sustainable seafood practices and commitment to encourage ocean stewardship. The San Diego Oceans Foundation’s (SDOF) most prestigious honor, the Roger Revelle Award, is awarded annually to a San Diegan in science, academia, industry, military, recreation or philanthropy who demonstrates personal initiative in encouraging stewardship of the world’s precious ocean resources. The award is named for the late Dr. Revelle, the fifth director of Scripps Institution of Oceanography, the driving force in creating the University of California, San Diego, and the first Director of the Center for Population Studies at Harvard. Past recipients include: filmmaker Howard Hall, Dr. Walter H. Munk, and Milton Shedd. This year’s recipient, Andrew Ryland Spurgin, is an innovator, inspirational leader, and an incredible culinary master. Mr. Spurgin is a chef/partner at Campine, A Culinary + Cocktail Conspiracy and is the co-founder of Passionfish and Cooks Confab. He also sits on the Advisory Board of Catering Magazine and Event Solutions Magazine. He is an Associate Board Member of the Slow Food Convivium San Diego. He is a past member of the Director’s Cabinet for Scripps Institution of Oceanography and E.W. Scripps Associate. He assisted in the development of Blue Ocean Institute’s “Green Chefs Blue Ocean” program, a national curriculum addressing sustainable seafood education for culinary students and continuing education for chefs. He sits on the Board of Trustees on the International Catering Association’s Educational Program and is a co-founder of The Culinary Liberation Front. Mr. Spurgin has produced and designed menus and events throughout the United States, in addition to Canada, England and Mexico. He regularly lectures to the industry and public and youth audiences too on sustainability, cooking, event design, culinary responsibility and entertaining. His events, interviews and photos have been featured in numerous local and national magazines, radio and TV. San Diego Home/Garden inducted Mr. Spurgin into the Chefs Hall of Fame in 2011. San Diego Magazine named him and Cooks Confab 50 People to Watch in 2011. He has received the coveted ACE Award as Best Caterer in the West, Spotlight Award as National Caterer of the Year, he has consistently won accolades from a host of local magazines and media as Best Caterer in San Diego. Mr. Spurgin has taken a leadership role with the San Diego Oceans Foundation as this year’s Culinary Chairperson for their upcoming sustainable seafood week and gala fundraiser at SeaWorld San Diego. Mr. Spurgin has been instrumental in educating chefs worldwide on the importance of sustainable practices in and out of the kitchen. His dedication and passion for the sustainable movement inspires others and proves that a simple choice can be delicious and have a lasting, beneficial impact on our environment. 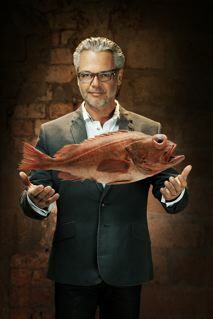 The award will be presented at SDOF’s sustainable seafood gala on April 26, 2012 at SeaWorld San Diego’s Turtle Reef exhibit. This event is SDOF’s largest fundraiser of the year, which funds their education and research programs in the community. Unlike most seated dinners, our guests roam the 14 different celebrity chef stations where they can interact with the chefs, learn about the proteins and understand their roles in sustainability.